You can put off some jobs needing to be done in the home, but the time comes when the clamour for attention becomes too much. This forlorn looking sink unit was cheered up with a coat of paint by owner Lucy a few months ago but it was the wrong kind of paint. Claypaint can’t be wiped clean, and in no time at all the doors were streaked and stained. To clean the failed paint away I experimented with various stiff brushes and a variety of scourers together with warm soapy water. Mop up the water as you scrub as liquid left to pool on the surface may warp the wood and raise the grain. This in turn creates an unpleasant furry effect that will spoil the finish. Once scrubbed, I wiped the woodwork over with clean water, then mopped with dry cloths to absorb the moisture. Allow the wood to dry slowly and naturally – don’t use a hairdryer or a portable heater as this may cause the timber to split or distort. Once the surface was completely dry I rubbed it over with fine glasspaper, going with rather than against the wood grain to make a smooth surface for the new coating of eggshell paint, which is eminently wipeable. For cleaning purposes Lucy prefers using natural products whenever possible, so I opted for elbow grease and the simple household solutions that our grandmothers would have used before the advent of modern miracle sprays. Lucy chose Farrow & Ball’s water-based Breakfast Room Green Estate Eggshell paint for the cupboard doors (01202 876141; farrow-ball.com). The Danish oil for the sink drainer was supplied by Liberon (01797 367555; liberon.co.uk). 1. Clean up the ceramic sink: The stained ceramic sink is in a sorry state. Make up your own cleaner by stirring 1 tbsp of bicarbonate of soda into half a pint of water. Use a bottle and shake to mix. This works best if the sink is still warm from washing up – apply with a cloth and rub away stains. For stubborn stains, apply and leave for an hour or two. 2. Remove tannin stains naturally: Tea bags and vegetable peelings can cause ugly staining if left in the sink. Rather than using chloride bleach to remove stains, put in the plug, pour in some hydrogen peroxide and leave overnight. Environmentally kinder products such as this take longer to work than chemical equivalents that give instant results. 3. Dissolve limescale from taps: Limescale on stainless steel taps can be removed with lemon or lime juice or vinegar*. Squeeze juice or vinegar on to kitchen paper and wrap it round the taps, then twist half a lemon on to the tap spout, tying it with a cloth if necessary. Leave this overnight to do its work of dissolving encrusted limescale. 4. De-grease the sink waste pipe: Harsh drain cleaners should be avoided, particularly if you have a septic tank. Make your own by mixing 4 tbsp salt, 4 tbsp bicarbonate of soda and 1 tbsp cream of tartar, then pour down the sink followed by half a pint of hot water. Do this every week and it will stop odours and keep the pipe free flowing. 5. Prepare wooden drainer for oiling: Wooden draining boards demand constant care. Mop up any spills on the surface straight away to prevent the wood warping or cracking. To deep clean, scrape away dirt and grime, then scrub with warm water. Rinse, wipe up excess water and rub with a dry cloth. Allow to dry before applying a new coat of Danish oil. 6. Apply a new layer of Danish oil: Danish oil should be applied monthly to protect the drainer wood and keep it looking good. Store the oil in a warm place overnight and apply in a heated kitchen so that it penetrates well. Apply the oil liberally and rub in with a cloth. To avoid a tacky finish wipe away any oil remaining on the surface after 20 minutes. 7. Apply undercoat to the woodwork: Always choose the right type of paint to match use and location. Woodwork in a kitchen needs to be finished in a durable, wipeable paint. 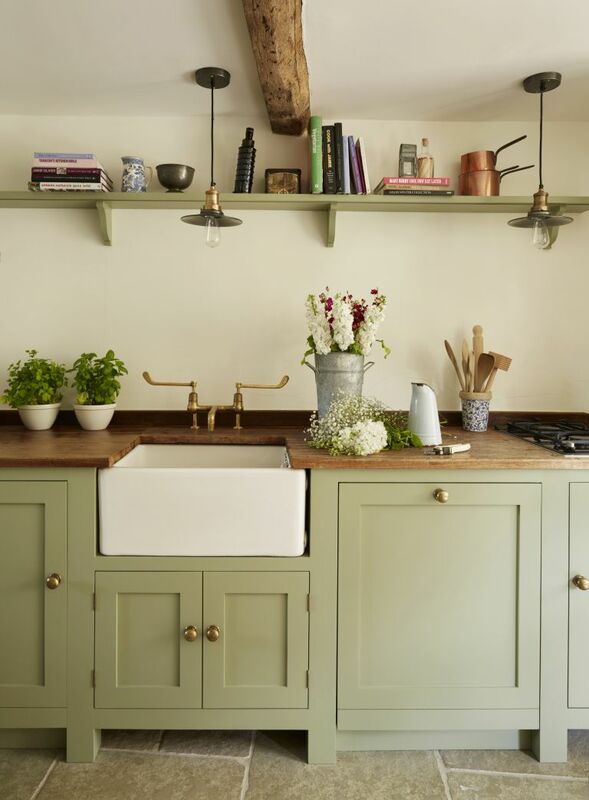 Gloss can be used, but an eggshell or satin finish is more sympathetic to a period home. First apply an undercoat of wood primer to achieve an effective, durable finish. 8. Repaint cupboard in a new shade: Wait four hours for the undercoat to dry, then apply two coats of eggshell or satin finish paint. Load the brush generously or use a roller. For a professional finish lightly sand the dry paint with fine glasspaper between coats (allow at least four hours). Wipe with a damp cloth to pick up dust before applying the next coat.